1. Can you use a flexible homeschool curriculum? Using the Charlotte Mason method, for example, makes it easier to school around work. Other methods of homeschooling lend themselves more to the crazy lifestyle that a work-at-home mom endures. Be sure that the method you choose can accommodate travel, meetings, or busy times in your business. 2. Can you use a self-directed method? On the other end of the spectrum are the more rigid classroom-based curricula that work well when the student is in charge. If your kids are reading well, can take responsibility for their own work, or do well with online or software-based curriculum options, you can allow them to be in charge of their school work, with you monitoring or checking in frequently. Some online courses are especially effective for this type of learning. Veritas Press self-paced courses, for example, or the free teachings at Khan Academy come to mind. 3. Can hubby or relatives help? You may need to outsource some of your work-at-home tasks. You may want to outsource the teaching. We do a combination of both, with hubby teaching the math, social studies, and Bible, while I handle the English, Art, and Reading. Both of us work from home. 4. Can you teach year-round? Or on a compressed schedule? We do school just 3 days a week, all year long. This allows plenty of time to work in my business conference travel, illness, and life, in general. If you can teach your kids all year, it helps them to not lose much of their learning while you are on break, and it takes some of the pressure off you to teach 2-4 hours each and every day. 5. Can you take advantage of non-traditional learning? I think that the idea of allowing a highschooler to learn upper-level science and math from the community colleges online is a fantastic one, and it frees the parent up from having to learn the materials and then teach it (which can be time consuming and stressful.) If you can enroll your child for this purpose, do so. The low cost per credit hour that colleges often offer for homeschool high schoolers is worth the time you have to get more work done. 6. Can you lower your expectations? If you need the kids to be at school to keep your home clean, forget about having much order after you bring them all home to learn. Yes, they can pitch in, but it's a different ball game when you are trying to work AND educate the kids. Younger children, especially, will create more mess and require more attention. If the home is safe and can be cleaned thoroughly once a week, you've likely accomplished something great. Don't stress yourself out over the rest. As you can see, it is possible to homeschool while working from home. You obviously won't have the same day as someone who doesn't have a full-time job and domestic duties to worry about. The laundry will likely pile up. I have found the balance of both worlds possible, however, and I would have made any other decision regarding the care and education of my kids! 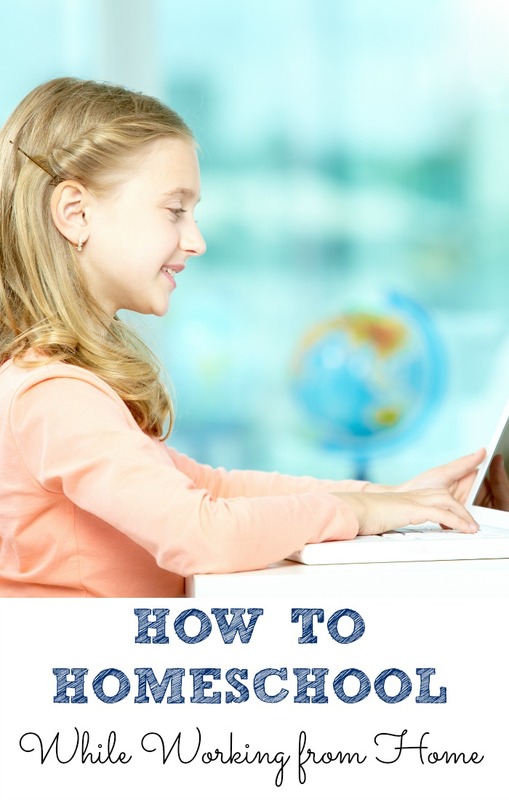 Do you homeschool AND work from home? We'd love to hear your story! What is the Pinterest plugin that you use, that adds the pretty Pinterest logo in the center of the image upon hovering?